If you have never made your own mincemeat, then this is the recipe to change your mind about homemade versus shop bought. My lovely friend Rachel makes this every year and sells it at the school Christmas. Children will love mixing this all up and then bottling it. I also think it makes a great gift, I love getting food presents…one of my favourite things! Mix all the ingredients together in a large, non-metallic bowl. Cover with clingfilm and leave for a week, giving the occasional stir. After a week, pot into cooled, sterilised jars and cover. Keep for a further 2 weeks before using. Variations – try apricots or red/green glace cherries for a more festive look! You could also add cranberries in place of some of the apple. This recipe has just been given to me by my ‘Beer Cookery Specialist’ Stephen Spaeder. 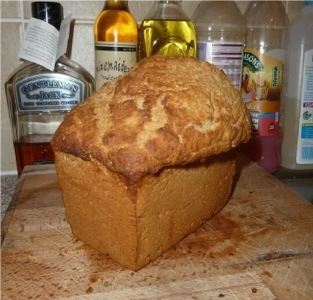 Stephen decided to make his own bread for my ‘Beefy beer and Bread’ recipe, giving this dish a double whammy of beer! This bread takes minutes to prepare, no kneading, no long wait and is a perfect partner for any beef stew. You really need to give this a try and let us know how you liked it. It was an absolute winner in our house. 2. Pour the beer and 1/2 of the melted butter into the dry ingredients and mix well. 3. Place the dough into the greased bread tin. Now pour the rest of the melted butter over the top of the dough, which will give the bread a delicious crispy crust. 4. Bake in the middle of the oven for 1 hour. 6. Enjoy :). Please feel free to leave a comment on the blog. This is one of my favourite winter recipes. It smells so good and will leave a really christmassy aroma throughout your home. 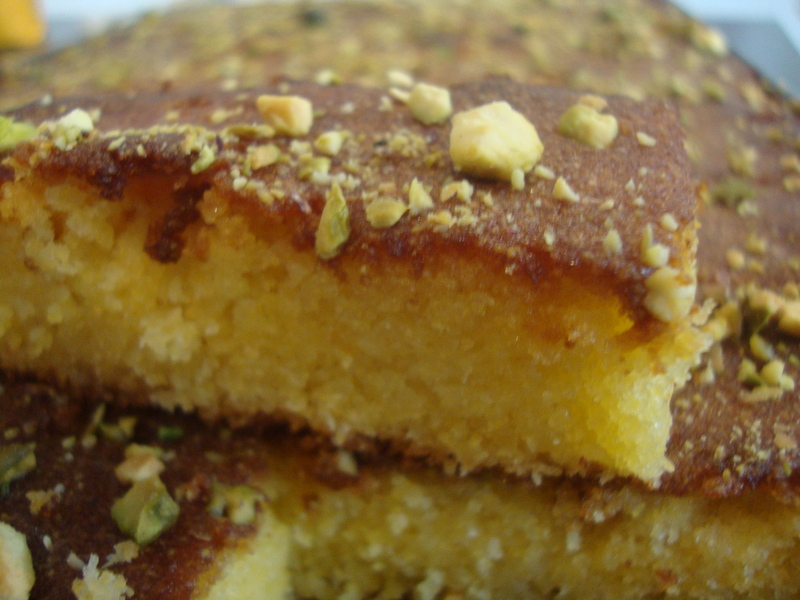 This recipe is simple and uses very few ingredients. The pears need to be hard which makes things easy as finding ripe pears at this time of year is often difficult. I like to serve these delicious pears with some vanilla flavoured creme fraiche. 1. Preheat oven to gas mark ½, 250°f, 130°c. 3. Lay the pears in a casserole dish on their sides and pour over the wine, add the sugar, cinnamon sticks and vanilla pod. 4.Bring everything to the boil on the hob, then cover and bake on a low shelf in the oven for 1½ hrs. Then take the casserole pot out of the oven and then turn the pears over on their other side. Cover and put the pan back into the oven and cook for a further 1½hrs. 5. Lift the pairs out of the pot and into a serving dish. Remove the cinnamon sticks and vanilla pod. 6. Place the casserole dish with the spiced wine back on the hob. Mix arrowroot and alittle water in acup to make a smooth paste. add this to the liquid whisking as you go. Bring just up to simmering point. remove from heat. 7. When the syrup is cool, spoon over the pears, basting them well. Cover and place in the fridge to chill. 8. Serve the pears (stood up) in individual bowls with creme fraiche or ice-cream. Enjoy! This is a great dessert for when you need a mega chocolate boost. It consists of store cupboard ingredients, so when you get that sudden urge to have a yummy dessert, you can! As you will see it takes minutes to make and is very easy. The only skill in this recipe is the timing of the cooking of these little puds…too short a time and they will be too runny, too long and there will be no molten effect. Only start to cook them when you are absolutely ready to eat them. I did make these up hours before they were needed for a dinner party and popped them in the fridge. If you do this just make sure you get them out of the fridge and bring them to room temperature before putting them in the oven. Pour in the melted chocolate while the mixer is going, and whizz until just combined. Grease and sugar 6 ramekin moulds of approx 150ml capacity. Half fill the moulds, the mixture is fairly runny. Cook at 180 degrees for exactly 10 minutes. They should be just set on the outside and soft and gooey on the inside. Release each pudding from its mould by using a flat knife around the edges of the dish. Place a small tea plate over the dish and holding onto both dish and plate with a tea cloth, turn over so pudding is then on the plate. You can serve with ice-cream, creme fraiche or cream. I also like a bit of fruit sauce to go with it…raspberries are good. This is a recipe that Jill and I with our www.twocreativecooks.co.uk hats on, have been cooking alot of lately. 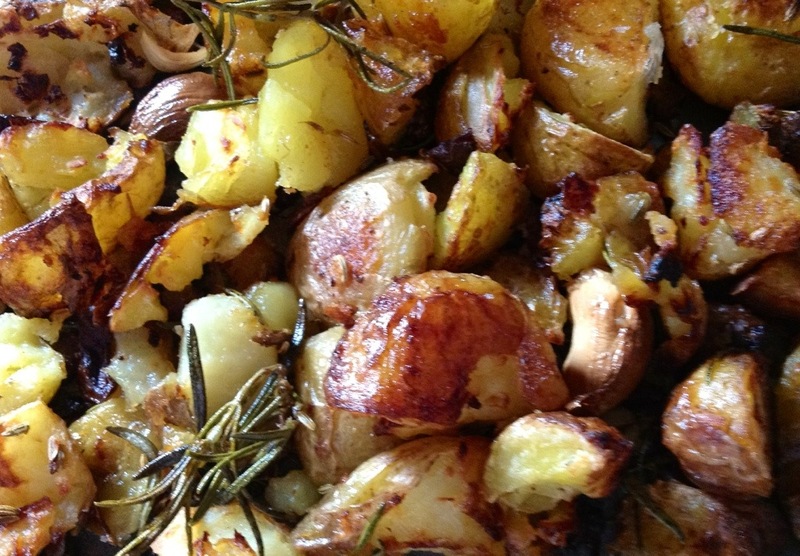 It’s a great way to turn New (or old) potatoes into something a little different. Great to eat with BBQ food or to go with fish or a summer roast. If you decide to give these a go make sure you make double because they will be devoured ! 1. Preheat the oven to gas 6, 200°c, fan 180°f. Bring the potatoes to the boil an a pan of salted water. Simmer for 10 minutes until just tender, then drain. 2. Add the oil and butter to a roasting tin and heat in the oven until the butter has melted. Add the potatoes and toss in the fat to coat, then gently squash eah potato witha fork. Sprinkle with sea salt, black peper, fennel seeds and rosemary and roast for 30 mins. 3. Turn the potatoes over using a spatula or spoon, then add the garlic and roast for a further 20-30minutes, until the potatoes are golden and crispy, and the garlic ha softened. There is now a greater demand for gluten free foods. My feeling is that this might be due to our diet being too heavily bulked out with processed wheat. I know personally that too much wheat in my diet makes me sluggish and bloated, I think this is pretty common problem. To never have the joy of eating a slice of homemade cake would be unthinkable. So, I have for you a great tray bake that is easy to make, tastes delicious, will freeze well and it won’t leave you feeling like a bloated porker…what more can you ask? In a large mixing bowl , cream the butter and sugar, then beat in the eggs one at a time, followed by the ground almonds, polenta, salt and vanilla. Finely zest and juice the lemon and add to the mix. Line a baking tray (38 x 26 cm /15×10″approx) with baking paper, pour in your mix, level out and then bake for approx 50 minutes. When the cake comes out of the oven it should still have a slight wobble on! Make the syrup by roughly zesting the oranges and lemons with a peeler and placing in a saucepan along with the juice add the caster sugar. Place on the heat hob and heat until the sugar has dissolved, then strain through a sieve into a bowl and put to one side. When the cake comes out of the oven, prick it all over with a fork and then pour or brush over the syrup. You can then sprinkle the pistachios on if using them. Leave in the tin to cool. Cut into slices. Store in an air tight tin. Don’t forget this freezes well, so great for lunch boxes through the week and friends in need of a cake hit! I have battled with the cereal Isle and children for many years. My problem is the standard of ingredients of most children’s cereal. I’m not a purist but I resent buying expensive sugar/glucose laced cereal that has very little nutrition in it. Cocoa Crunch is an alternative cereal that ticks the boxes for Maisie and I. Give it a go and let me know how it goes down in your household. Preheat the oven to 180°c/350°f/ gasmark4. Line a large baking tray (or two smaller ones) with greaseproof paper or baking parchment. Melt the sugar in the water over a low heat to make a syrup without caramelising it. Do not stir or disturb the sugar and water mixture at all while it is melting. Take off the heat and allow to cool until warm and then melt the vegetable oil and chocolate in the syrup, add the honey and mix well. In a large bowl mix together the oats, Rice Crispies, coconut and cocoa together. Add the syrup mixture to the dry ingredients and mix thoroughly. Spread the mixture on to the prepared baking tray to a thickness of about 1cm (½inch). Bake for about 35-40 minutes, and using a fork, turn the Cocoa Crunch regularly. Be careful not to crush it into fine crumbs though; it should remain as chunks, like a granola. It is better to under cook the Cocoa Crunch as it can burn easily, especially around the sides of the baking tray, so do watch it carefully. Leave to cool. Once completely cool store in an air tight container. I use glass storage jars…because they look nice and if I’m completely honest with you, I like to see that jar on the shelf and know that I won the cereal isle battle! I stepped ouside this morning to go for my early morning run and nearly stepped straight back in. 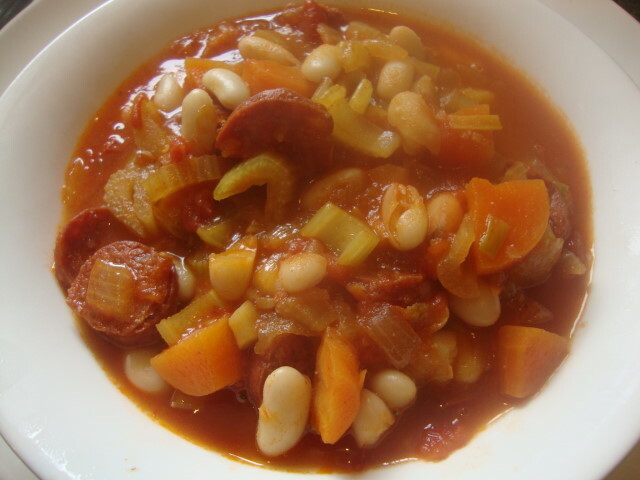 The temperature fluctuations in this country are becoming a joke and so my friends I bring you a touch of comfort on such a day, in the form of a very simple, but extremely tasty soup. Enjoy! This recipe is from Donal Skehan a 24yr old Irish lad, with a big passion for food. Fry the chorizo in a large pan until it is golden and has released its lovely spicy oil. Remove the chorizo with a slotted spoon and set aside. Add the onion, celery and carrot to the pan and fry gently for 3-4mins. Stir in the garlic, paprika, chilli pwder and cumin and fry for 1 min. Add the chopped tomatoes and stock and season. Stir well, return the chorizo to the pan and bring to the boil, then reduce the heat and simmer for 10 mins. Add the beans and simmer for a further 5 mins or until the veg is tender and the beans are heated through. Serve with crusty bread. If you have some flat leaf parsley available, chop some up and sprinkle over the soup, it adds a lovely fresh flavour to it. This makes a great roast any time of the year, but is especially good during the hotter months when doing a full roast can all a bit too much.This is quick and easy and uses minimum pans. 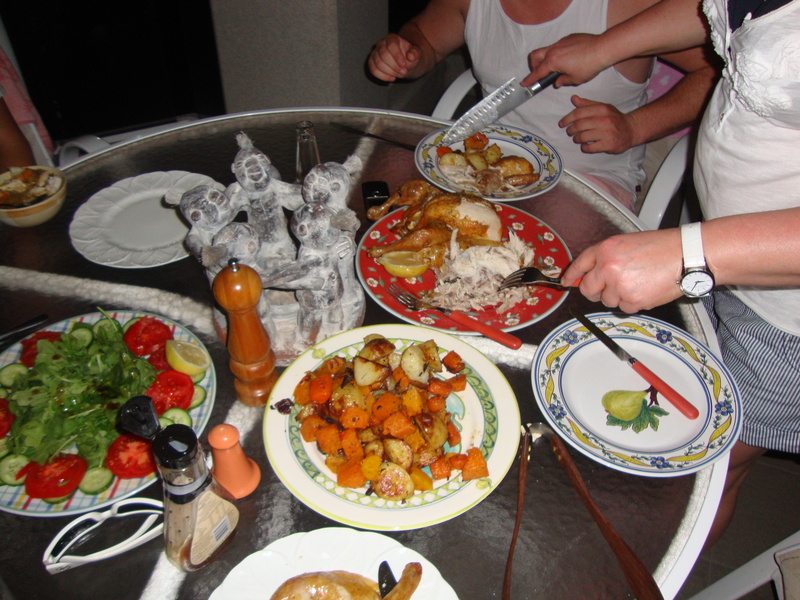 It was the first meal I cooked when we arrived in Australia and they loved it! Pre-heat oven to 190 °C / Fan 170 °C prepare the chicken by washing in cold water and removing any giblets etc. dry with a paper towel and place on a roasting dish. Season with salt and pepper and sprinkle with herbs. Drizzle with oil and rub into the skin of the chicken. Meanwhile warm the lemon in the microwave for 30 seconds or in a pan of boiling water for 2 mins. Carefully pierce the lemon with a fork and place inside the cavity of the chicken.This not only allows the lemon vapours to seep into the chicken meat but also starts to cook the chicken from the inside out, speeding up the cooking process. Place in the oven for 1hr 20mins. Prepare vegetables as stated in the ingredients list and place on a baking tray, drizzle with olive oil and season with salt and pepper and some dried herbs of your choice. Toss the vegetables in the seasoning and oil and spread them out on the baking sheet. Put the veg in the oven 35 mins after the chicken has gone in, cook for approx 45-60 mins, turning the veg a couple of times during cooking. You will be able tell when the chicken is ready by inserting a skewer into the centre of the leg of the chicken, if cooked the juices should run clear. Cover and leave to rest for 15mins while the roasted veg finish off. We served this with a mixed salad and balsamic dressing…place it all in the middle of the table and tuck in!